A very dear friend of mine gave me a beautifully cross-stitched framed image. 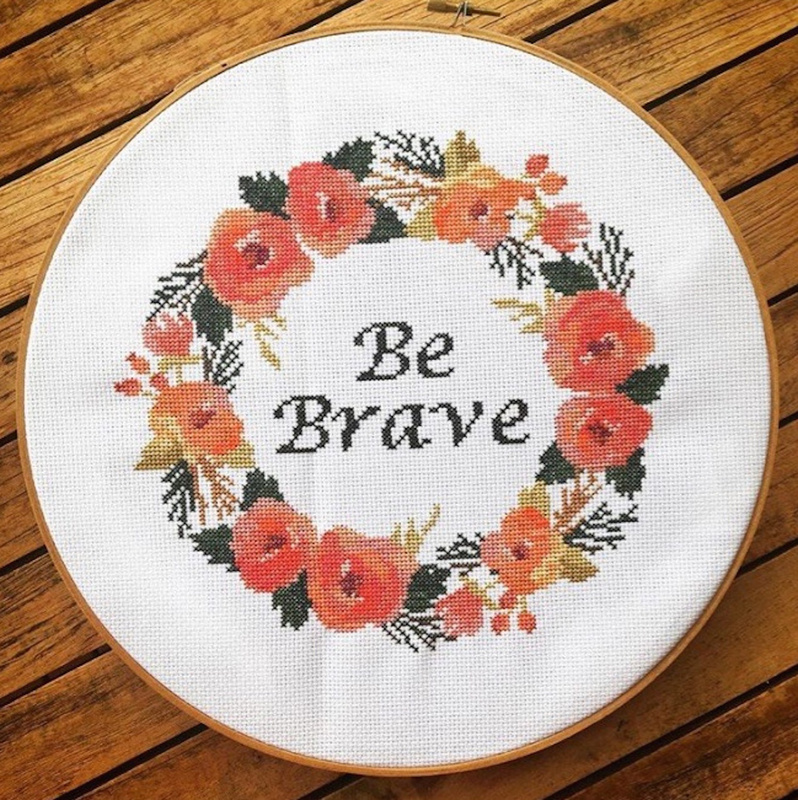 It has a ring of flowers around the outside and “Be Brave” across the middle. It rather suits my style – floral, elaborate, handmade. But sometimes I have difficulty dealing with the actual part of being “brave.” I’ve been told numerous times how “brave” I am, how resilient, how much spirit and endurance I must have to endure what I have endured. It feels like the accolades are a bit much – am I brave just because an awful thing happened to me (which I couldn’t control), or is my reaction to the awful thing what makes me brave? I won’t deny that the cancer was awful, horrendous, whatever superlative you wish to add. But was the long years of unrelated illness beforehand not brave? Was I not already resilient? It’s difficult when the focus is on the cancer and nothing before or after. As a someone who underwent surgery rather than the more expected chemotherapy or radiation, I never feel quite as brave as other cancer survivors. It’s as if perhaps my surgery, my amputation, my hellish recovery is not as difficult as someone who has undergone a year of chemotherapy, or months of radiation. I know I shouldn’t feel this way – it’s not a comparison of whose journey was more difficult – but I do. I lost part of my body, but I never had to have a port, or lose my hair, or have burns. But the reason I never had those treatments were because they weren’t an option – my cancer generally can’t be treated with chemotherapy or radiation. Which in itself is gut-wrenchingly awful. The fear of knowing if my cancer returns there aren’t many treatment options feels like having a self-destruct button in my body that might go off at any moment. Maybe it’s dealing with the uncertainty that’s brave. Maybe it’s just carrying on each day, going about my life, that others see as brave. Maybe my insistence to return to as many things in my normal life as possible, to be determined to get as much out of the time I do have. But I can’t help but think of those who aren’t able to do that. As far as I’m concerned, if you live a day with cancer, you are a cancer survivor. And I think of all the survivors who aren’t with us. Maybe I can try and be brave, for their sake.